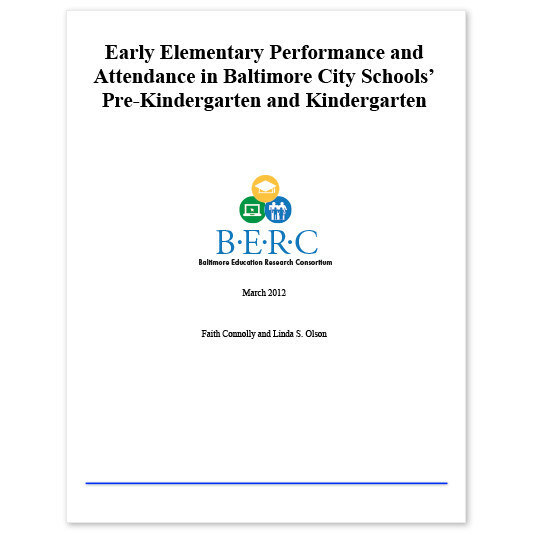 Connolly, Faith and Olson, Linda S., Early Elementary Performance and Attendance in Baltimore City Schools’ Pre-Kindergarten and Kindergarten, Baltimore Education Research Consortium, Baltimore, Md., March 2012. This brief looks at attendance in the early grades with particular focus on Pre-Kindergarten (PreK) and Kindergarten (K) and follows these young students over time. The study finds that students with low attendance in both PreK and K often continue to have low attendance, are more likely to be retained by grade 3 and on average have lower academic outcomes than peers with better attendance. The impact can be minimized, however, by improved attendance in later grades. Head Start students began with and maintained high rates of attendance compared with comparable students. They initially underperformed in reading and math but by Grade 3, they performed as well as their peers on the state assessment.